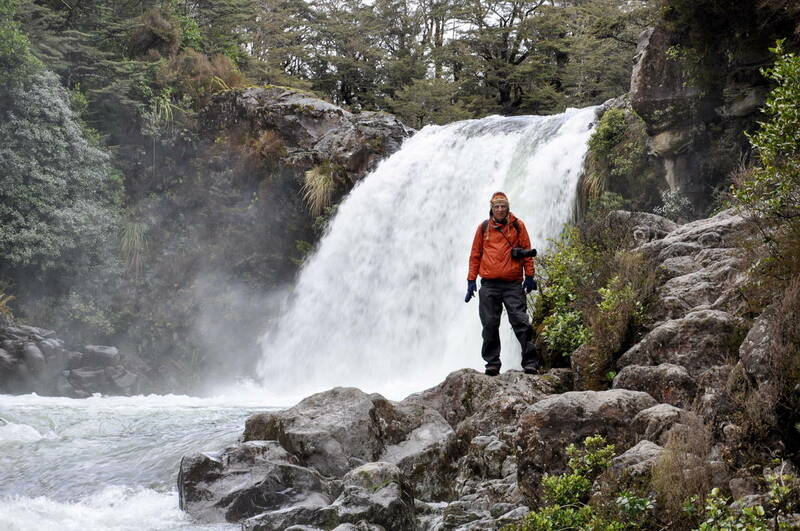 While in New Zealand, we had a real mixed bag of weather conditions. Our time spent in Mt. 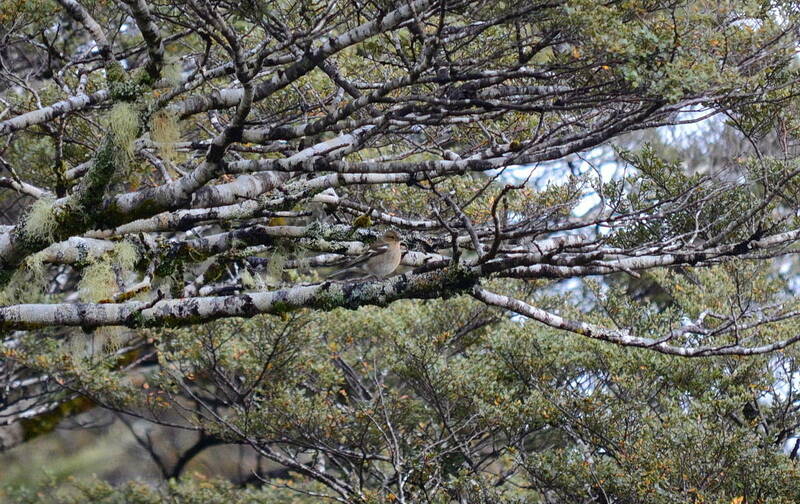 Tongariro National Park was under grey skies for the most part with driving rain, snow, sleet or hail. 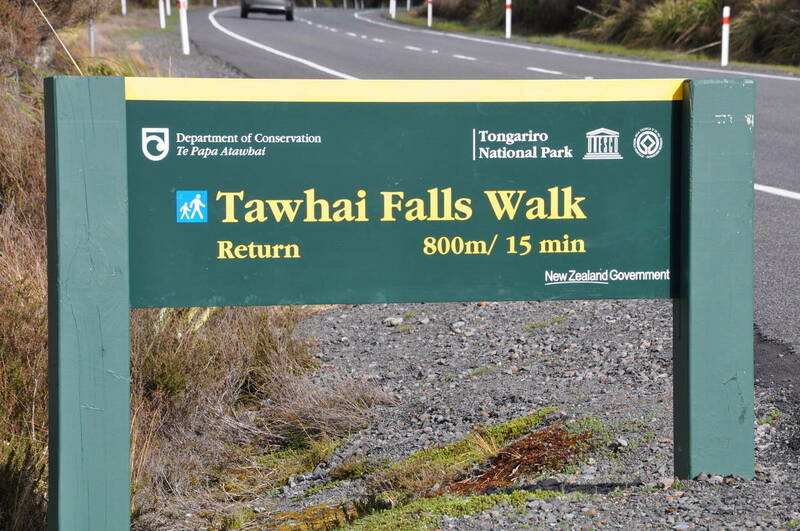 Our hopes of hiking the Tongariro Alpine Crossing were dashed owing to strong winds, so we made the best of things and opted for some other scenic hikes, one of which was the Tawhai Falls Walk. Since the hike would only require a half hour to complete, it fit the bill late one afternoon to round out our excursions for the day. Add to that the fact that the sky was growing brighter in the west, and we figured we might get some nice light on the Falls by the time we reached the river’s banks. 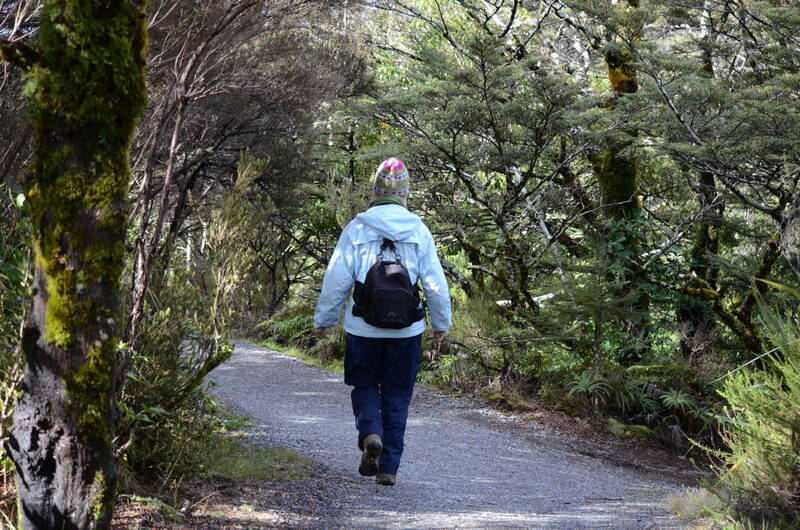 Like most hiking trails that we used in New Zealand, the surface was a well maintained spread of pea gravel. Given the wet conditions, it helped to keep our boots and feet dry. 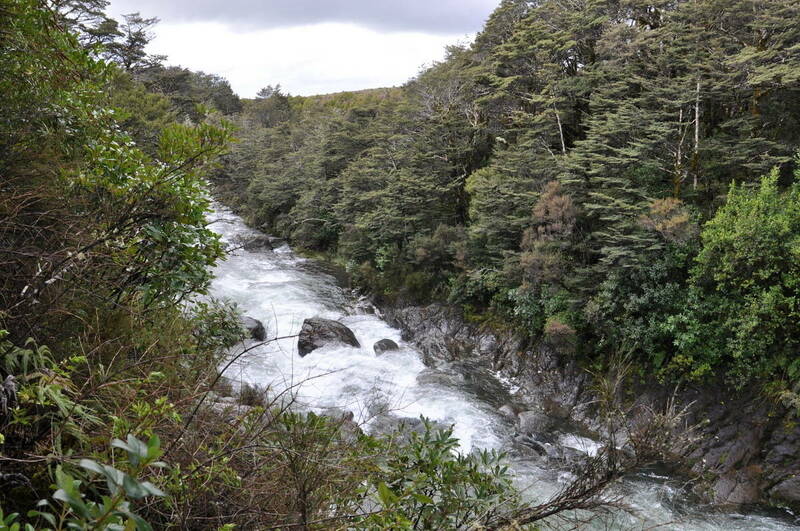 Because of rainy conditions the previous three days, the Whakapapanui Stream was severely swollen, the current and volume making a huge impression on us as the water surged along the time-worn channel. 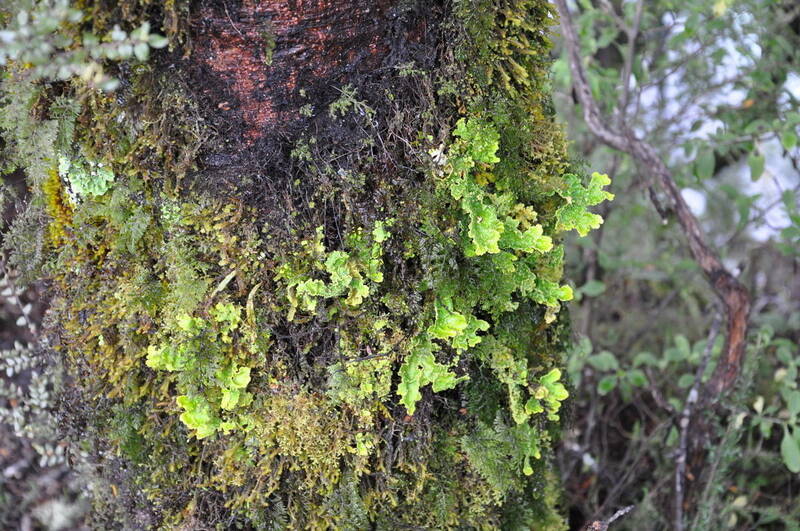 The track conveyed us through Mountain Toatoa and Beech forest where everything was glistening with moisture. I was intrigued by the microcosms of vegetative growth that flourished everywhere including the vertical surfaces of tree trunks. 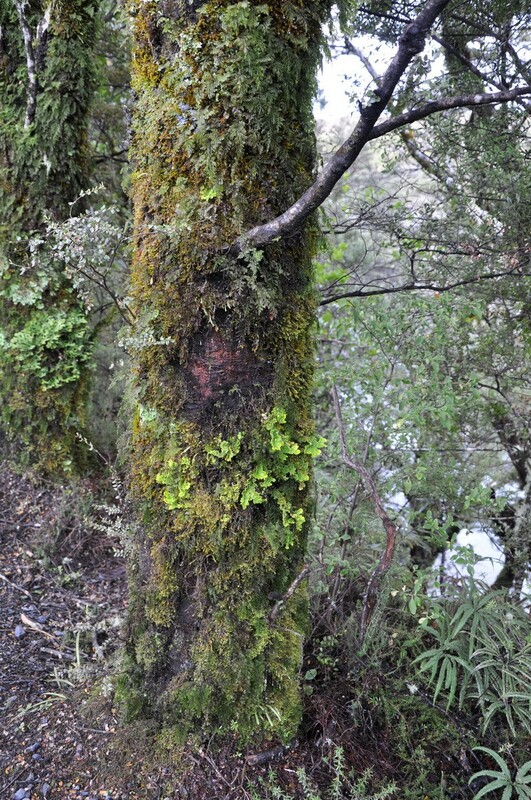 One bole alone supports a vast number of plant species. I had only to look at any one tree to find a separate and unique world of growth where all the plants seem to benefit one another. I was fascinated and at the same time rejoiced in the sea of green that transformed even this short walk through the riparian habitat into one of wonder. A fork in the path had us venturing a short distance to an overlook above the brink of Tawhai Falls. 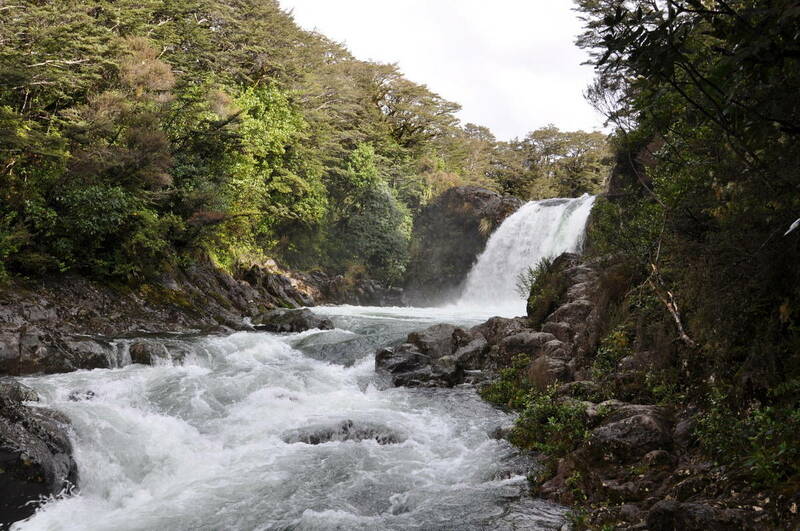 The source of water for Whakapapanui Stream is a ski field on the slopes of Mount Ruahepu, the country’s largest active volcano. 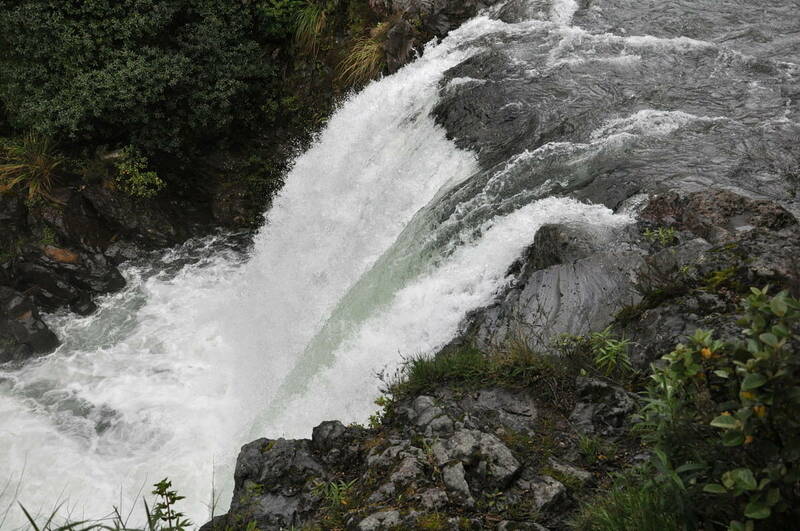 Situated above Whakapapa Village, the ski field is a distance of about 19 kilometres from the Falls. 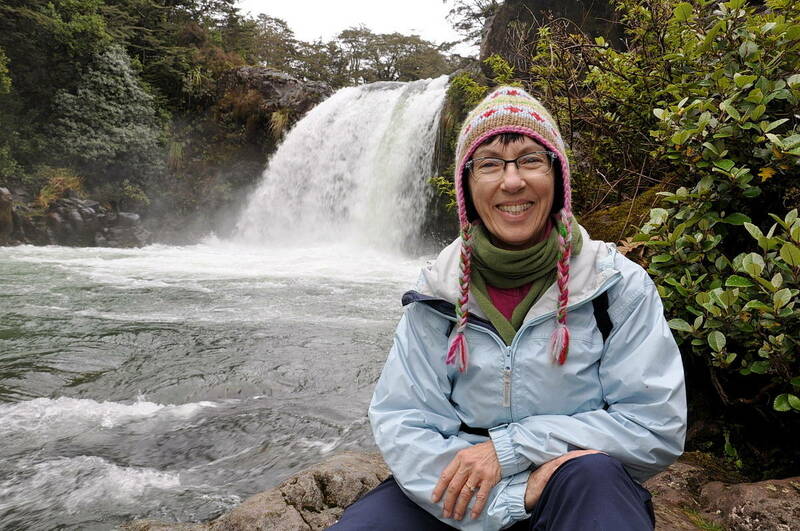 Anxious to get to the bottom of the cascade, I scurried on down the trail for a look back at the Falls as they were seen in the movie Lord of the Rings. 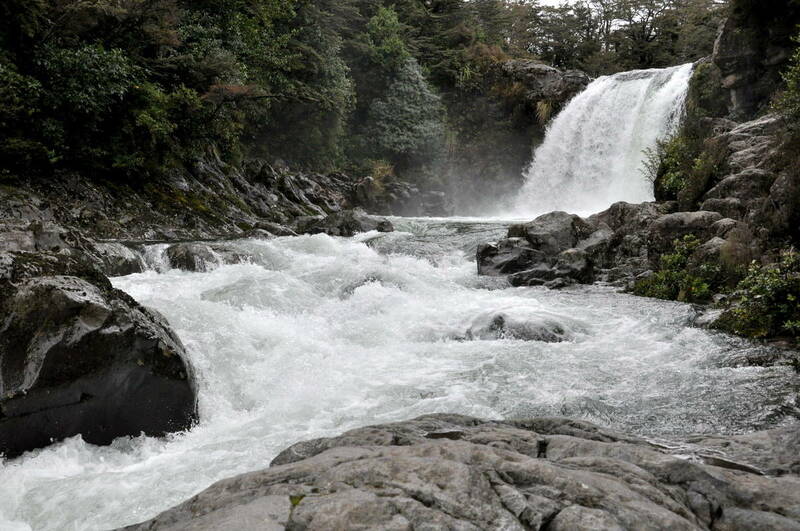 Tawhai Falls was just one of many shooting locations that the director, Sir Peter Jackson, used when in New Zealand for his series of movies that include The Hobbit. 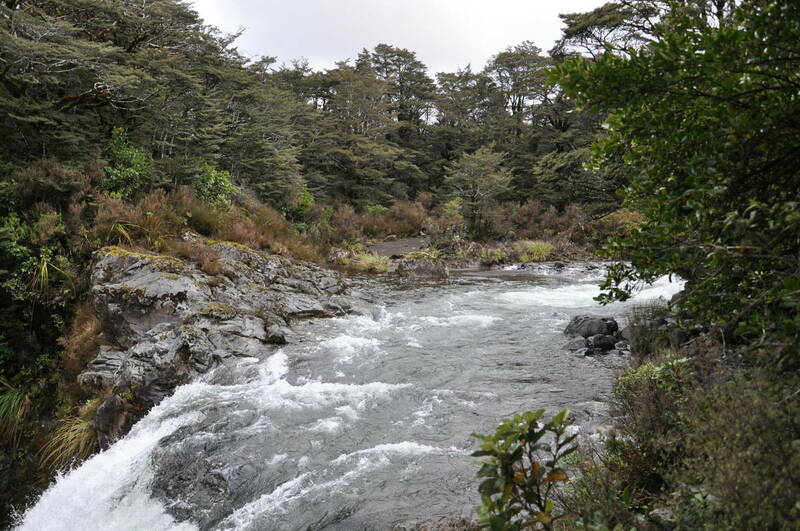 I am sitting on one of the rocks at the edge of Gollum’s Pool where Gollum was singing and bashing a fish against the rocks under the watchful eye of Faramir and his archers. 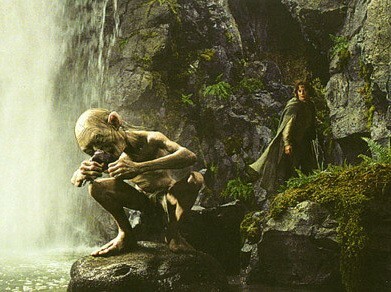 In this scene we see Gollum as he eats the freshly-caught fish just as Frodo Baggins comes on site to entreat Gollum to follow his Master. The precipice at Tawhai Falls is a mere 13 metres high, but with the heightened waters flowing over the edge of the ancient lava flow, it was fearsome to behold. While I waited for Bob to catch up with me, I kept a safe distance well below the plunge pool. 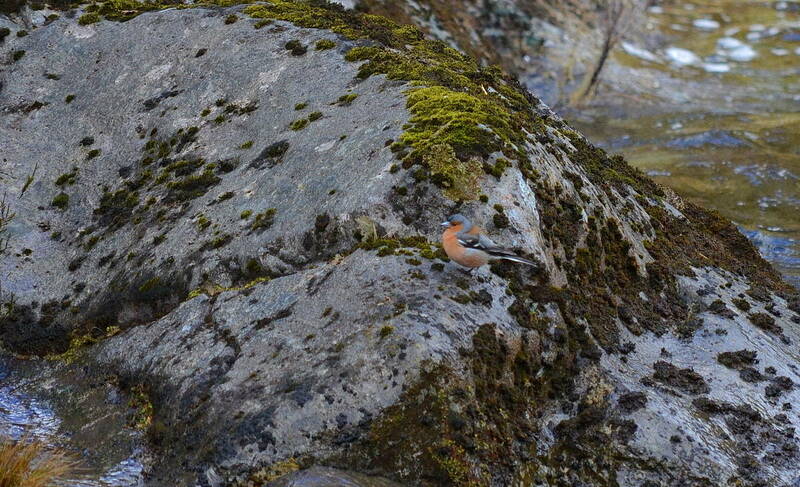 Back at the lookout, Bob had caught sight of a colourful male Chaffinch on the far edge of the Stream. Its beautiful greyish-blue plumage worked to camouflage the bird on the wet rocks, but it was the vibrant brick-red breast that drew Bob’s eye to its location. As Bob observed the male Chaffinch frolicking at the edge of the water, its mate perched on the branch of a tree whose branches extended out over the Stream. Finally Bob came in search of me to assure himself that I was safe and sound. Not quite tossing aside regard for his own safety, Bob made a beeline for a closer look at the deep plunge pool at the base of the cataract. It required close attention to the wet rocks and slippery bank along the shore to gain this safe position next to the thundering water. A quote from J.R.R. 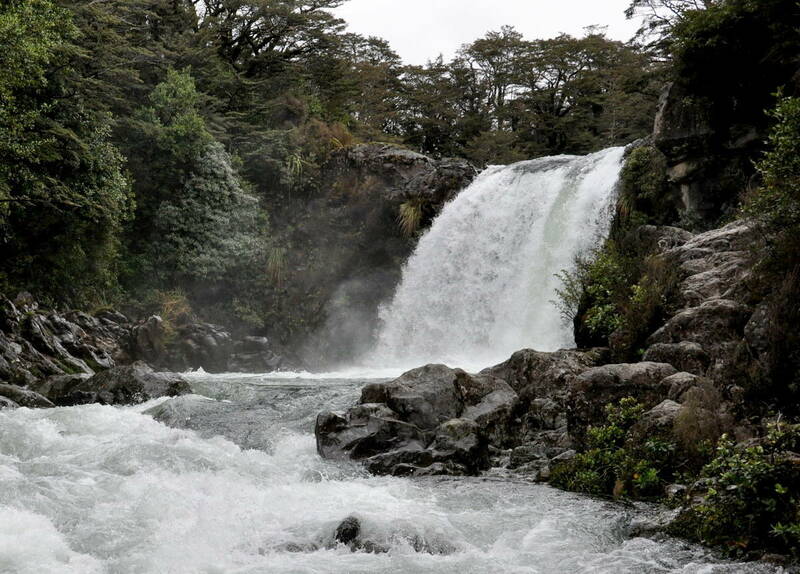 Tolkien’s book, The Two Towers, describes the scene at Tawhai Falls quite handily. No wonder the director felt this location could perfectly represent Gollum’s Pool. “Far below them they saw the white waters pour into a foaming bowl, and then swirl darkly about a deep oval basin in the rocks”. With the roar of rushing water blocking out any other sounds, it was relaxing there in the chasm watching the mist slowly rise. As spray dampened my face, I realized that the sun’s rays never did pierce the heavy clouds, but I was almost glad. The setting so perfectly captured the atmosphere in The Lord of the Rings: The Two Towers with dark shadows hiding some of the landscape’s detail. And even though the water level was too high to reveal the natural rocky trolls as detailed in The Hobbit, all I had to do was look at the knobby rocks and imagine them coming to life.